CBC Information Morning-Live in New Ross! & Learning Centre grand opening! As part of the opening events for the new Learning Centre, CBC Information Morning is doing a live radio broadcast from the Ross Farm Museum! On Thursday May 5th, from 6-8PM, the community is invited to a meet and greet with Information Morning host Don Connolley- in the hearth room and on Friday May 6th from 5:55am-8:37am CBC Information Morning will broadcast live from the “Exhibition Room” where the quilt show will take place-the public is also able to attend. 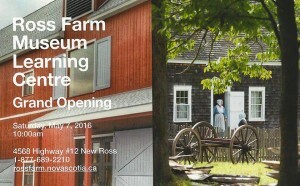 Please join us to celebrate the official opening of the Learning Centre at Ross Farm on Saturday, May 7th for the ceremonial ribbon cutting, a heritage quilt exhibit curated by Polly Greene, hand-made Nova Scotia artisan wares in The Pedlar’s Shop, as well as our traditional fun-filled Farm fare. Oh, and cake! For further information on the Grand Opening ceremony activities check out: Grand Opening of Ross Farm Learning Centre.